When I received an invitation from Disney to give the All-New Star Tours Experience a go, I was sad that I couldn’t attend. However, the next best thing was to ask new Trippin’ with Tara contributor Mindy Kate to jump in a give it a go. 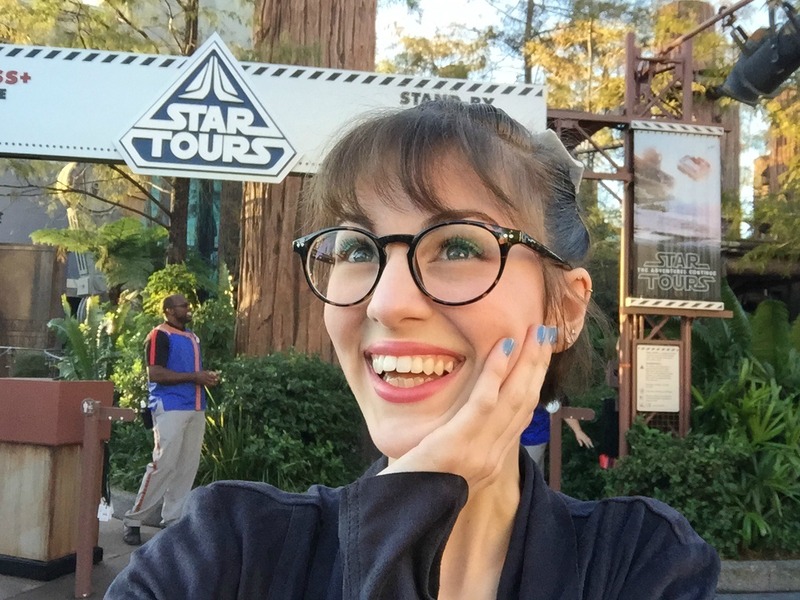 Miney Kate had the opportunity to be on one of the first flights to a brand new destination coming to Star Tours – The Adventure Continues at Disney’s Hollywood Studios® Theme Park. Jump to hyperspace aboard the Starspeeder 1000 on your way to a brand new destination, the planet Crait, which we got our first glimpse of in the teaser trailer of Star Wars: The Last Jedi earlier this year. You will be among the first to ride the attraction before the park opens! Booking my trip aboard the newly improved Star Tours has to be one of the best vacations I have ever taken! Thank you for all the droids that work with Star Tours who made this trip so worth it and so memorable. I can’t wait to fly with you all again! Although it did get a bit dangerous and rebellious, I was so excited to be a part of the Resistance and helping out my heroes like Maz Kanata, Poe Dameron and the incredible Finn who flew courageously in the Millennium Falcon! I can’t believe we flew into battle against the First Order on the planet Crait. We’re lucky we made it out alive and landed safely on the never before seen planet Batuu! Batuu was breathtaking, with its city like architect while also full of nature and wonder. I can’t wait to explore these new destinations and I hope that you all book your trip with Star Tours soon! May the force be with you, always. I love this girl! Her excitement is contagious! Based on the Star Wars films, Star Tour takes Walt Disney World Resort guests to multiple Star Wars destinations where they interact with characters from throughout the Saga. And it’s all in 3-D.
With an eye-popping digital presentation leveraging Dolby 3-D to deliver a vivid and realistic experience, a dramatic musical score and motion simulator-based technology, guests are immersed in the Star Wars galaxy like never before on a theme park attraction. So? What did Mindy think? And in a new twist, guests may be able to enjoy the attraction multiple times without ever experiencing the same adventure. 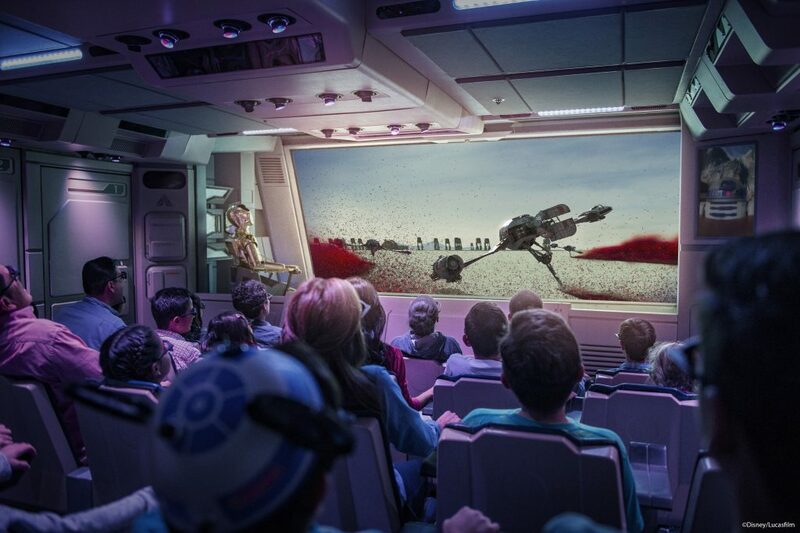 More than 50 story combinations are possible for guests to experience aboard Star Tours. 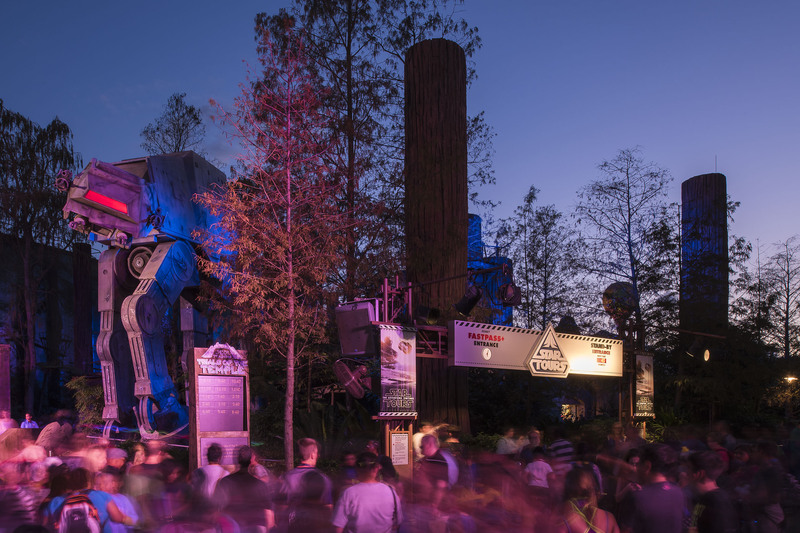 Just as the Star Wars films immerse movie-goers in storylines that keep them on the edge of their seats, Star Tours will feature multiple stories and scenarios that will hurtle park guests throughout the Star Wars galaxy. And all of the storyline’s twists and turns will be random, affording guests the chance to ride the attraction multiple times. All your favorites, old and new in the All-New Star Tours Experience! Entering the attraction queue area, Star Tours guests walk into a bustling spaceport. The famed Star Wars droid duo, C-3PO and R2-D2, greet them as the Starspeeder 1000 is prepped for service. Anthony Daniels, the voice of C-3PO and the only actor to appear in every theatrical chapter of the Star WarsSaga, reprises his role as the golden protocol droid. Daniels worked with Walt Disney Imagineering to record new dialogue for the attraction. Introducing guests to AC-38, a hotshot droid pilot known simply as “Ace,” and Aly San San (voiced by actress Allison Janney), the “spokesbot” for the spaceport. After winding through the spaceport, guests board the Starspeeder 1000 spacecraft and prepare for Star Tours Flight #1401. Through a series of mishaps, however, C-3PO finds himself in the pilot’s seat instead of Ace. It’s up to him and R2-D2 to navigate their passengers through the galaxy. However, the tyrannical Empire is out to stop the Starspeeder at all costs. C-3PO and R2-D2 take the controls and try to outwit and outrun the Imperial forces and a galactic bounty hunter hired to pursue the spaceship and its passengers. Utilizing the 50+ random story combinations. The Starspeeder then embarks on a wild trip through the galaxy, visiting several planets made famous in the Star Wars films. Among the locations that might provide haven from the Empire’s pursuit are the icy planet of Hoth, the lush jungles of Kashyyyk and the underwater Gungan world of Naboo. And along the way guests may encounterStar Wars characters that offer to help (or hinder) their journey, including Yoda, Admiral Ackbar, Darth Vader and Boba Fett. “Skytroopers,” a legion of stormtroopers created just for the Star Tours attraction story, might even join in the chase. For more information and to purchase theme park tickets or book vacation packages, guests may visit disneyworld.com/startours. 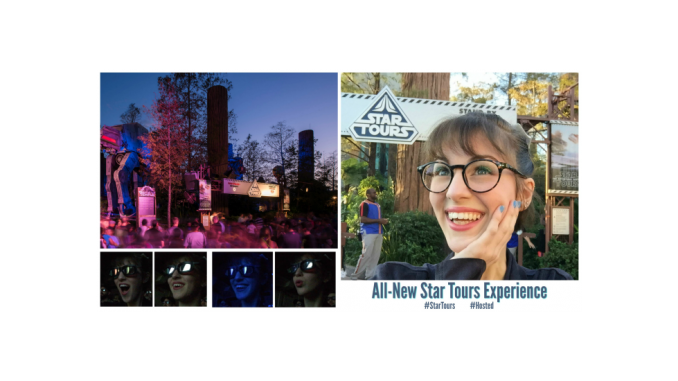 *Disney invited Trippin’ with Tara to experience Star Tours to share all about the attraction with our readers. All opinions and excitement are completely our own. Hey Buddy!, I found this information for you: "All-New Star Tours Experience". 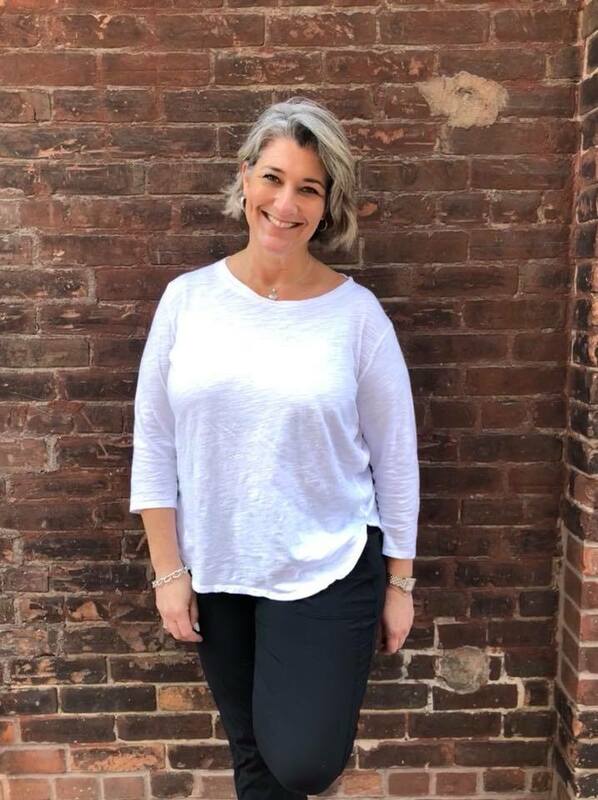 Here is the website link: https://www.trippinwithtara.com/all-new-star-tours-experience/. Thank you.